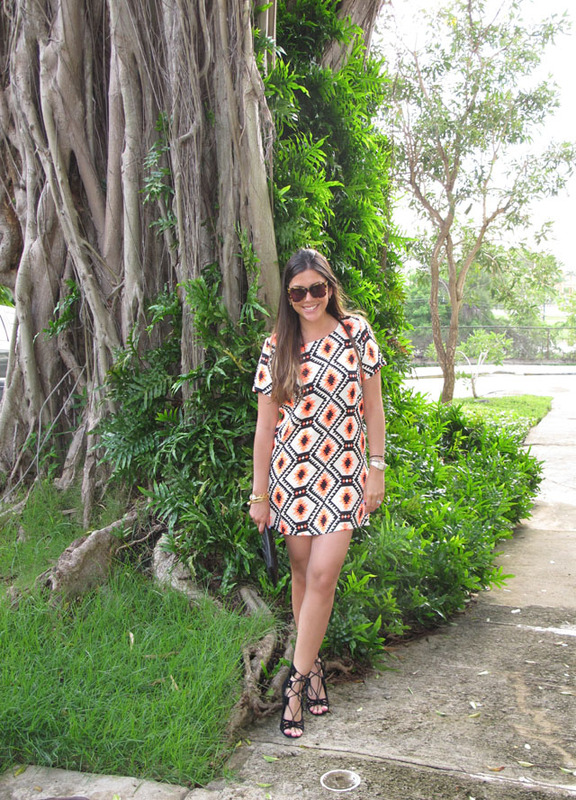 This dress is one of those pieces that can be worn anywhere and for any occasion - hence why it made the trip with me to Puerto Rico. Thanks to Missguided, a UK based online retailer, I was able to score this amazing tribal print dress for a price that you wouldn't even believe (one of those too good to be true kind of prices). And yes, Missguided has an amazing array of other dresses, tops, jeans, and accessories to choose from so it's definitely one of those websites you'll want to add to your favorites tab. This fun shift dress, paired with simple black accessories, went with me on a fancy date night and to cocktails with friends afterwards. As I hinted to earlier, one of my favorite parts of this printed frock is the fact that little to no accessories are needed for it to look perfect. The tribal print speaks for itself without being too loud or outrageous. It's one of my first printed dresses for the season but it definitely won't be the last. Cheers to Missguided, summer time dresses, and the fact that my credit card will be seeing a lot of charges bearing the name "Missguided." p.s. Enter code USA20 to receive a 20% off AND free shipping on ALL orders at Missguided! Disclosure: Compensation was provided by Missguided via Glam Media. The opinions expressed herein are those of the author and are not indicative of the opinions or positions of Missguided. You look Fabulous!! i love this dress on you and you are so right no accessories are needed for this at all!! I am going to have to check them out!! Loving this dress, may just have to pull the trigger on the green one! You look soooo pretty!! Those shoes are amazing!